Z-ABS is optimized for your Zortrax M200, M200 Plus and M300 3D printers. Use it to quickly and easily produce durable ABS prototypes, parts and objects. You can use ABS to additive manufacture prototypes, models and end use parts. Z-ABS is a standard thermoplastic filament developed and manufactured specifically for the Zortrax M-Series. 3D print with it on your M200, M200 Plus and M300. Zortrax M-Series 3D printers use LPD (FFF / FDM)-3D printing technology. These 3D printers create 3D objects using the extrusion of molten filament. You can use third-party filaments on your Zortrax 3D printers. However, Zortrax Z-ABS is optimized, tested, and comes with preset parameters for use on your M200, M200 Plus, and M300. It is easier to print in 3D than third-party ABS filament. Furthermore, Z-ABS is the most efficient and convenient filament to process if you want to use ABS on your Zortrax M-Series 3D printer. Z-ABS is perfect for test parts, functional prototypes and concept models. You can also use this material for additive manufacturing of final components. ABS is lighter and more durable than PLA. For example, LEGO bricks are made of ABS. 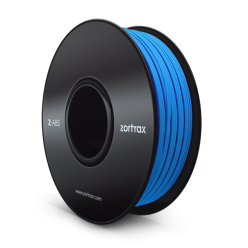 Zortrax Z-ABS filament is available in a variety of colors. Designers, engineers and inventors can use this Zortrax filament to develop, test and produce much faster and more reliable end products for the market. Z-ABS, along with Z-Suite software features, offers excellent aesthetics and mechanical properties. Buy Z-ABS filament to get an optimized filament for the Zortrax M-Series (M200, M200 Plus & M300) and 3D print prototypes, objects and end parts of stunning quality.